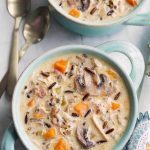 One of the best soups I make is Instant Pot Wild Rice Soup with Chicken. 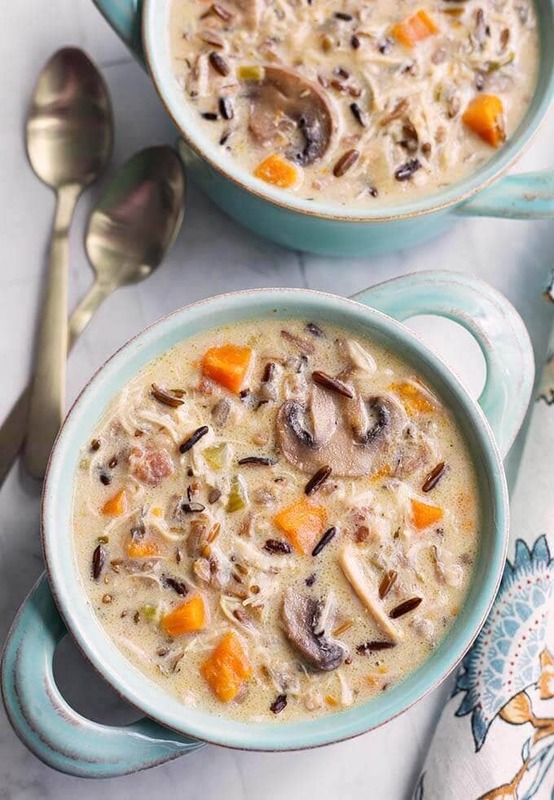 It uses real wild rice, earthy seasonings, mushrooms, and chicken, to make a hearty, classic soup. 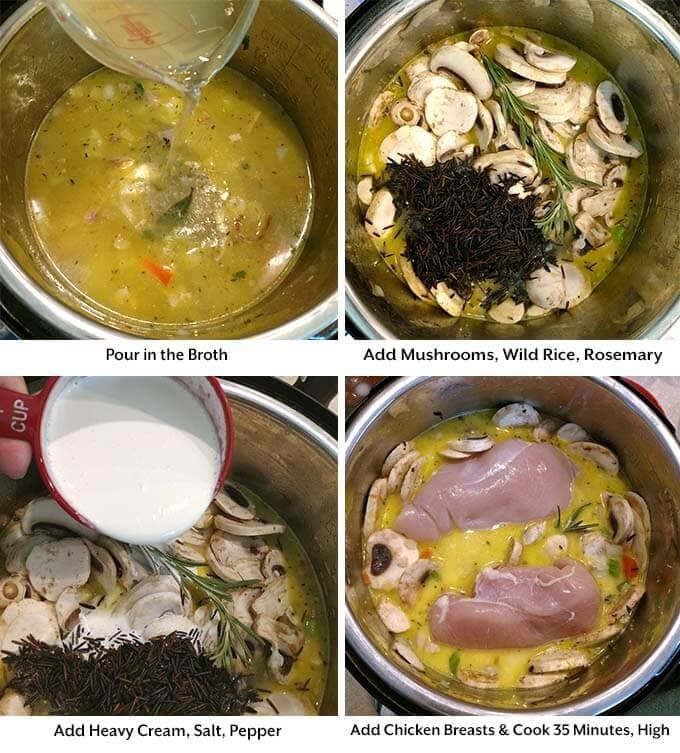 This pressure cooker wild rice soup with chicken is a staple from the beautiful state of Minnesota, and I adapted my mom’s recipe for the Instant Pot! It’s delicious! I am excited to make this recipe post! My love of soups is strong, and sharing fabulous Instant Pot soup recipes with you is so much fun! 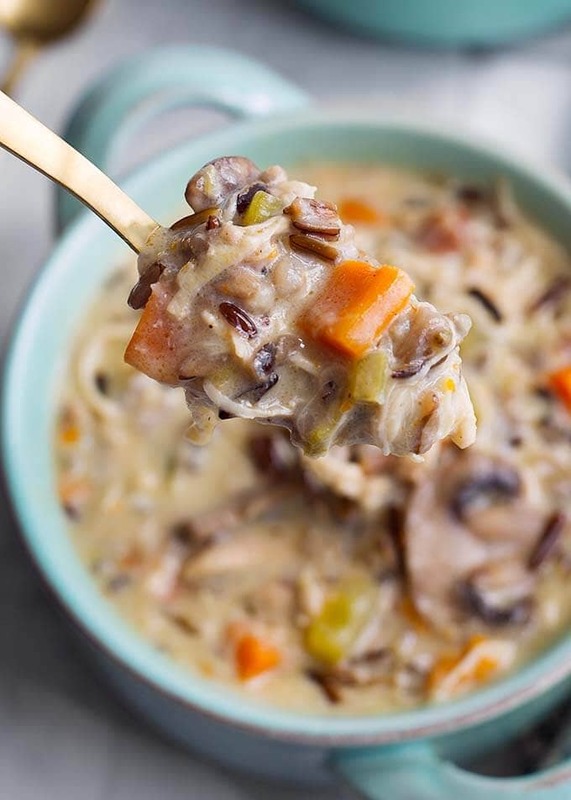 Instant Pot Wild Rice Soup with Chicken (or make it without meat) is so delicious, earthy, and hearty. With mushrooms, and just a few simple herbs and spices, and a creamy broth, it’s so good! First, a little history. Wild Rice is actually the State Grain of Minnesota. Did you know there was such a thing as a State Grain? I didn’t. 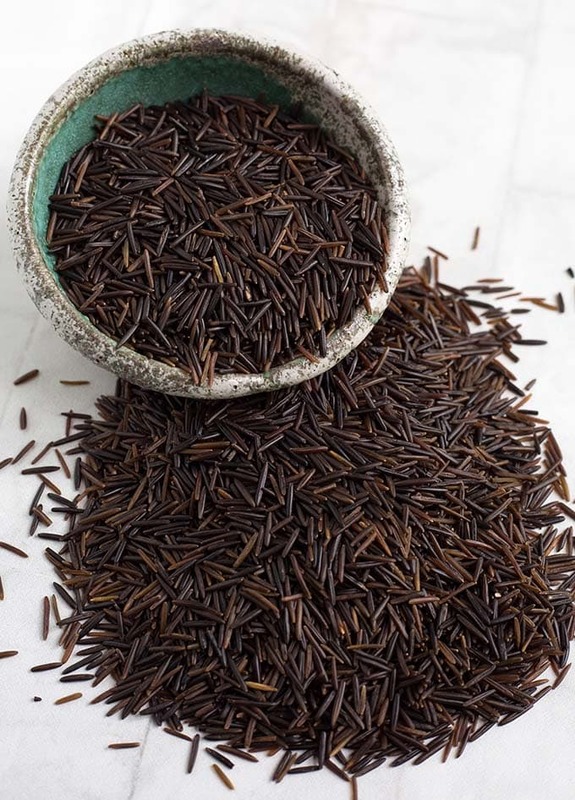 Wild Rice is native to North America, and mostly grows in the Great Lakes region. It has a higher protein content than most cereal grains. The color is a beautiful dark brown, and to me it smells a little like tea (though it doesn’t taste like tea). When cooked the grains “burst” and the texture is kind of chewy. In this recipe you only need 1 cup, and that is the perfect amount with all of the other ingredients. There are wild rice blends out there, but they don’t fare too well in this soup because the grains that are not wild rice get cooked away. If you can only find the wild rice blends in your grocery store, look for the ones with the highest percentage of wild rice in them. Look on Amazon, too. I provided a link below to the brand I like. This is a tasty, healthy soup that is total comfort food. I hope you enjoy it! 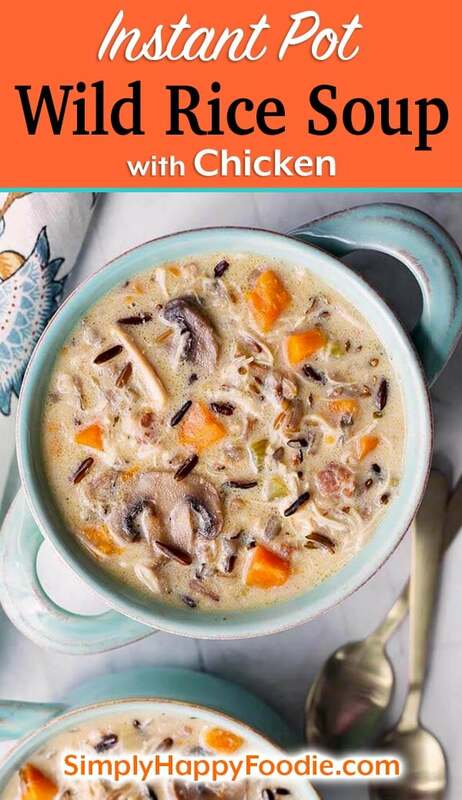 Instant Pot Wild Rice Soup with Chicken is delicious and hearty. With wild rice, mushrooms, herbs and a creamy broth. Turn the pot on to Sauté. Add the bacon pieces and cook, stirring occasionally, until mostly done. If you use a leaner bacon, leave the fat in. If there is more that 1 Tbsp of fat, spoon it out, leaving 1 Tbsp. Add the onion, carrots, and celery. Stir and cook a couple of minutes. Add the butter, bay leaf, and thyme. Cook for a couple of minutes. Add the garlic and stir it in, cooking for 1 minute. Pour in the broth and stir it well. Add the mushrooms, rosemary, rice. Stir. Add 3/4 cup of heavy cream, salt, and pepper, then stir. You can use half and half instead of heavy cream, if you want (if you want to use milk, add it after pressure cooking as it will not cook well. Heavy cream or half and half tolerate pressure cooking). Add the chicken breasts, and submerge them in the broth. Put the lid on the pot and set the steam release knob to the Sealing position. Then cancel the Sauté setting. Press the Pressure Cook/Manual button or dial. Then press the + or - button or dial to select 35 minutes. High pressure. When the cooking cycle is finished, let the pot sit undisturbed for 15 minutes (15 minute Natural Release). Then Manually release the remaining steam/pressure, carefully, using a controlled Quick Release (A controlled quick release is when you open the valve a little at a time to be sure no soup/sauce is going to spew out along with the steam when you release it. By starting out slowly and releasing the steam in bursts, you can avoid the mess! use a wooden spoon handle, or silicone oven mitts to avoid a steam burn.). When the pin in the lid drops down, open it up and carefully remove the chicken to a bowl. Mix the flour and remaining 3/4 cup of heavy cream together very well, and stir into the hot soup. Shred the chicken and add it back into the soup. Let sit for a few minutes to thicken. Serve hot. Even better the next day! This soup was so good even my picky 11 year old ate it! Thank you for the step by step directions, I’m still new to the Instant Pot. Will be making this again! That’s so awesome, Theresa! Thank you for your review! Hello! Just found your site when searching for mini Instant Pot recipes. Can’t wait to try them. I’m a newbie to Instant Pot, although a veteran slow cooker. If I cut the other recipes, like this one, in half, would they work in a mini? Wild rice soup is one of my favorites! Thanks. Hope you will put a book together! Love the whole food approach you take in your recipes. Hi MaryBeth! Yes, you can cut this recipe in half, but keep the cook time the same. I’m working on a book, so check back because when it’s finished I’ll be singing from the rafters (it’s a long process)! I see it says manual for 35min is that on High medium or low? Hi! I cant wait to try this recipe! I was wondering if you would change the measurements of anything for making it in an 8 quart IP? I’ve had some recipes turn out thicker than it seems it should at times . Maybe more broth? Hi Jerianne, This should be nice and thick, bit not too much in the 8 qt. But yes, you can add a little more broth if you’d like it thinner. Hope you like it! I thought my children and hubby were going to lick the inside of the pot AFTER fighting to see who won the opportunity. Needless to say we didn’t have any leftovers. Had to use brown rice I made in my rice cooker (added at end) as I didn’t have any wild rice. 5 out of 5 stars from my family! That’s so funny, Julie! I love it! Brown rice is wonderful. I found a better deal on the wild rice at Trader Joe’s. They have great prices! So maybe that’s an option for you if you want to try it. Thanks so much for your review! Does this freeze well? Excited to try the recipe! Yes it does! Hahaha We’re eating it right now! This soup was unbelievably delicious! I followed the recipe exactly and it turned out as a thick, rich and filling soup bursting with tons of flavor! My husband can’t stop raving about it! Do yourself a favor and definitely use the heavy cream instead of half and half or milk – the extra calories are worth it and it would suit a bread bowl well (going to try that with the left overs). Hi Sandy! I am so happy to know that you and your husband like this wild rice soup! Thank you for the nice review! Any suggestions on doubling the recipe? Made it this weekend and it was incredible! I’d like to make it for a crowd, but don’t know if doubling everything is necessary. Thoughts? Hi Ellen, I would just double it. The rice needs the liquid, so it should be good. I’m so glad you liked it! If you don’t have true wild rice would you recommend cooking the rice mixture before hand & then putting it maybe the last five minutes of cooking? need all the help I can get! Hi Alise, Yes, I would add it in last. So set the pressure cook time for 20 minutes, then when it is done add in the rice blend, stir, and bring it back up to pressure. Hopefully it won’t be too thick to get back to pressure. If it is, add a little more broth. Then set for 10-15 minutes and the natural release. I just made my own chicken stock so I have chicken ready to go. Should I cook for less time if not cooking chicken breasts in pot? Cook for same amount of time to cook the rice. Add the cooked chicken at the end and let it sit a few minutes to heat through. My Mrs is an amazing chef. For us to approve this as a 5 star dish is so ez. Loved it and will definitely add it to our menu planning! That’s great, Brad! Thank you! I’m very happy that you and your lovely wife like this recipe! That’s awesome, Moni! Thank you. I’m happy you liked it! Can I use frozen chicken? Do you know what the time would need to be adjusted to? Yes, frozen will work just fine. I followed the recipe perfectly, and this has to be the richest, most flavorful, and most comforting dish I have made in a long time. I will make it again, and will be proud to serve it to company. Thank you! Thank you, Laraine! 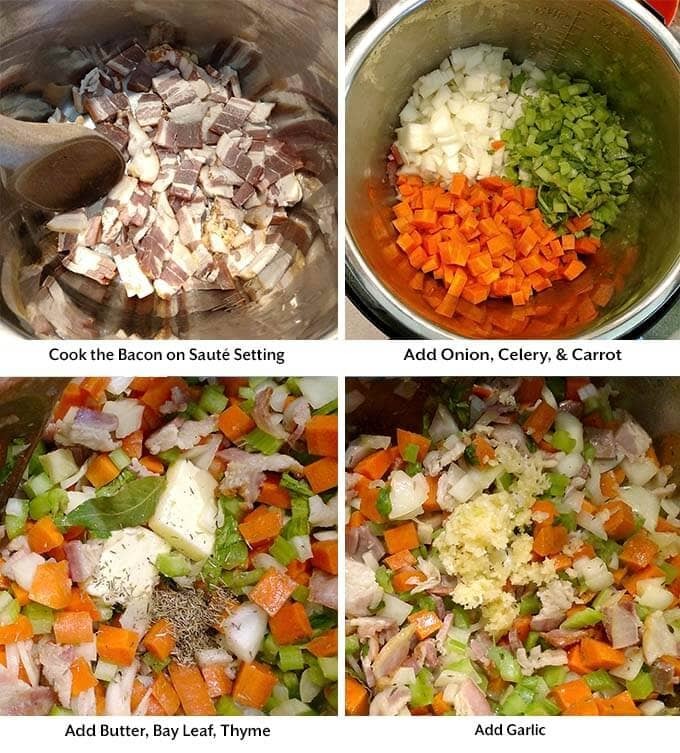 I am so happy to know you enjoyed this soup recipe! I made this last night for dinner. I was absolutely the best soup I think I’ve discovered in a long time. I made it with cooked turkey chunks left over from Thanksgiving. It was so good. I had to leave out the mushrooms (husband doesn’t like). After we finished eating he said “it was missing something”…I said “yeah, mushrooms”, lol We will definitely make again. That’s so great, Sheila! Just a FYI, Trader Joe’s has a mushroom powder that adds the umami flavor without having to use actual mushrooms. I think it’s called Umami Powder. Is this recipe for a 6 quart pot? yes, or the 8 qt. Excellent recipe. Had to use full fat evaporated milk for cooking and half and half to finish. Still wonderful. I did add the trader Joe’s Mushroom and Company Umani seasoning since I’m a bit addicted to it BUT it is a regional product! I bought it in Florida while visiting my mom then looked for it in Ann Arbor, MI and was tools it was regional!